Frameless glass shower doors can hang from an overhead track or from side hinges. Since they do not have a frame, the track or hinges must be attached directly to the glass, or at least appear to be. Actually, the hardware usually clamps the door when you tighten the screws, and a rubber gasket between the hardware and the door prevents damage to the glass. When the screws become loose, the door can slip out and sag or hang unevenly. Readjust these doors with some wood to prop the door and a screwdriver. Remove the sliding glass door from the track by swinging the bottom toward the back of the shower and then lifting the door until the wheels at the top are free of the track. Lift the door away from the track and set it down on a flat surface. Loosen the screws holding the sliding wheels to the top of the door with a screwdriver until you can slide the attachment plates freely. Adjust the plates so that the metal at the top of the plate is seated against the top of the glass. Tighten the screws. Re-hang the door by going inside the tub or shower and lifting the door until it touches the top of the metal frame over the track. Angle the door so that the bottom is away from the door frame and hook the wheels into the track. Let the door swing gently into the frame. Open the door and wedge a piece of wood under the corner. Unscrew the hinges from the shower wall, starting with the bottom hinge. As you loosen the top hinge, the door will start to fall away from the wall, so hold it steady while you finish unscrewing it. Set the door on its edge on a bath mat or towel with the hinges facing you. Loosen the screws holding the hinges and slide the hinges until they are seated on the edge of the door, then tighten the screws. Some doors have a piano hinge with a clamp that extends the length of the door. Make sure the top of this hinge is flush with the top of the door and that the entire hinge is seated against the edge of the glass before you tighten the screws. 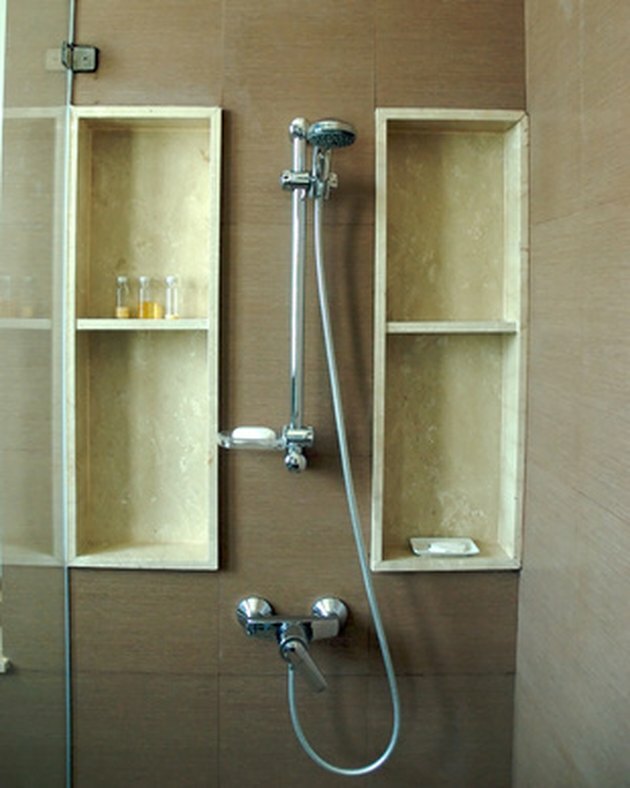 Set the door on the wood and move it into position so that the hinges are over the holes in the wall of the shower, then screw the hinges into the wall.